Our brief was to provide ceremony music for the bride’s entrance, background music during the signing of the wedding register, and to create a romantic atmosphere while the guests were waiting for the gorgeous bride to arrive. 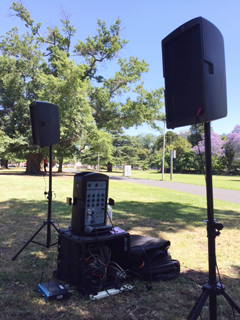 We also provided a cordless microphone for the wedding celebrant. 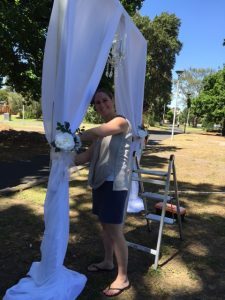 Quite often the situation arises in parks and garden weddings where there’s no power source available. This is no issue for Nightshift as our ceremony music service provides a portable battery PA system perfect for outdoor ceremonies. You, or your wedding co-ordinator, will need to obtain a permit to reserve a particular spot in your chosen park. 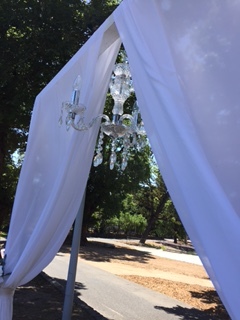 If there’s no shelter, consider providing shade umbrellas for the wedding party, guests and musicians. 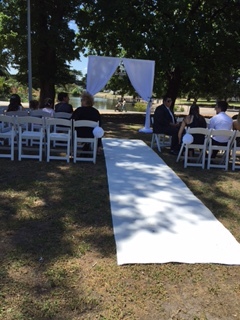 Invite your guests to the ceremony at least 15 mins early to allow them time to find parking, walk to the ceremony location, and to allow for stragglers. If you would like to enquire about our PA hire service or Ceremony Music service please visit our Contact Page. If you would like any of the beautiful decor featured in these photos please visit Circle of Love Weddings. That’s it! We’ll leave you with a few pics from today’s ceremony.